The Contigo Autoseal Water Bottle can be purchased on Amazon or other Department Stores for about $13.00. $13.00 seems expensive to me for a water bottle, but I needed something good that would last a while. The two things that lured me into buying the Contigo water bottle was its 32oz capacity and supposedly leak-proof water seal. As a school teacher, I am constantly moving around with text books, coffee cups, and papers which I have to keep dry. 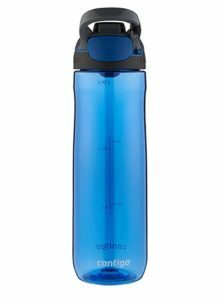 Also, the Contigo 32OZ water seal bottle is made from durable, BPA-free, light-weight plastic, so I can comfortably carry it in my laptop bag without worrying about spills. This particular Contigo water bottle is designed very ingeniously so you the water bottle remains sealed at all times until you push the button on the opposite side of while you drink from it. I can move around the classroom and take drinks without leaving the water bottle open or exposed to my germful students. I thought this was one of the best items I’ve purchased in a long time until about 3 weeks later. About a week after using the Contigo Autoseal bottle, I was cleaning the inside of the lid when a spring popped out. After a few minutes of struggle, I was able to get it put back inside the lid, but the fit and tightness of the seal never seemed quite as good as it was when it was newly purchased. Then, two weeks later I was merely pushing the Autoseal button to take a sip of water when I heard a crunch and pieces of plastic rattling inside the lid. I opened it up to find the plastic button had completely broken apart. I could still use the bottle, but no more autoseal – just another leaky water bottle. Time to look into the Contigo warranty. Just a week short of 2 months ago I sent in a warranty claim online. As of right now I still have not gotten any satisfaction. I took detailed pictures of the broken lid and sent it into customer service. They sent me an automatic reply stating that I should hear back in two to three weeks. When I hadn’t heard back after a month I wrote back and my email was returned with a message that the online mail box was full. Next, I visited their Facebook Page and left word that I was concerned whether or not they were still in business explaining my problem. To their credit, they sent me a reply on Facebook explaining that their online customer service was backed-up and suggested I should call. I still have never called them. It’s ridiculous to have to work this hard over a $13.00 water bottle. Also, I am curious if they ever will do anything about this online? The autoseal is such a great idea. To bad the quality on the Contigo hardware isn’t made better. I’ve got the chug water bottle and would like to know how do you clean under the seal to prevent mold?